Maize, scientific name Zea mays, also known as corn or mielie/mealie, is one of the most extensively cultivated cereal crops on Earth. More maize is produced, by weight, than any other grain, and almost every country on Earth cultivates maize commercially for a variety of uses. The abundant cultivation of maize globally has led to concerns about monocropping and biodiversity, especially since genetic evidence suggests that maize is radically less diverse than it was originally. In addition, maize is heavily genetically modified, and the crop has been used as a rallying point by the anti-Genetically Modified Organisms (GMOs) community. The exact domestication point for maize is unknown, but it is estimated that the crop is at least 5,000 years old. The plant was originally domesticated in Mesoamerica, and appears to be related to species of wild grass which still exist in Central American today. People in many English speaking nations know maize as corn. Originally, the term "corn" could refer to any type of grain. When maize was brought back to Europe, it was called "Indian corn," a reference to the source of the plant. The term was shortened to "corn" as maize became ubiquitous in many gardens. In Africa, it is known as mealies. Domesticated maize grows to a height of eight feet (2.5 meters). It is typically planted in rows to make it easy to harvest the female ears once they mature. The crop is also surprisingly vulnerable to pests and drought, given its global importance as a food source. The development of GMO maize was partially designed to address this issue, but some consumers are concerned about the introduction of GMOs into the food supply. When maize was initially cultivated in the Americas, it was grown along with beans and squash. The beans used the stalks of the maize to support themselves as they grew, while the squash offered a ground cover. The combination was also healthy for the soil, which was additionally enriched with alkaline substances. The addition of alkali to the soil proved to be an important part of growing maize, as alkali frees up niacin in the grain. When maize was initially exported to other regions, many people suffered from pellagra, or niacin deficiency, until the problem was identified and corrected. Maize, being popular as a food item, is enjoyed by people in various forms, like, whole corn, corn flour, cornstarch, corn gluten, corn syrup, cornmeal, corn oil, popcorn, cornflakes, etc. Apart from satisfying the taste buds of its users, maize is also a good source of vitamins, minerals and dietary fiber. The nutritional value of cornflakes is almost similar to that of cooked maize. 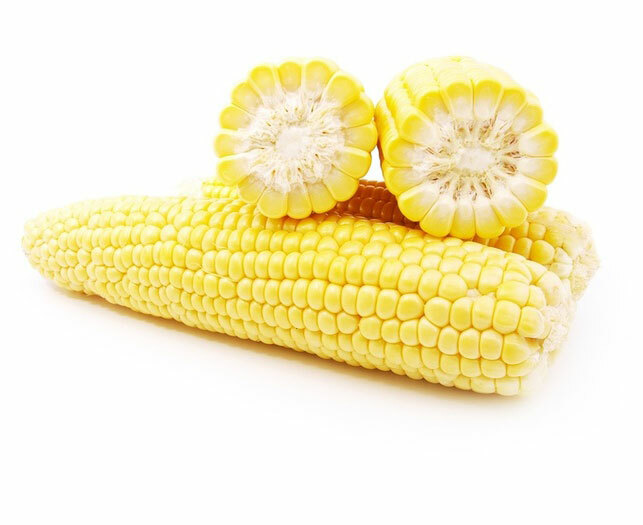 One large ear of cooked yellow maize contains almost 4 grams of protein, 3.5 grams of dietary fiber, around 30 grams of carbohydrates, 1.5 grams of fat, 3.6 grams of sugar, around 100 grams of water, no cholesterol and amounts to 126 calories. Below is more maize nutrition facts and information about the vitamin and mineral content in one large ear of yellow maize, which is cooked without salt. Apart from the above said minerals, traces of manganese and copper are also found in maize. The composition of maize endows it with many health benefits. The high fiber content prevents constipation and colorectal cancer. Antioxidants neutralize the effects of harmful free radicals that cause diseases like cancer. The antioxidant betacryptoxanthin prevents lung cancer, while lutein prevents age related vision loss. Antioxidants slow cognitive decline and conditions like Alzheimer's. Vitamin C boosts immunity and fights infections, while the presence of vitamin E gives maize anti-aging properties. Thiamine is required for boosting memory, cognitive functions and nerve health, and pantothenic acid is essential for energy, as it is linked to carbohydrate, protein and lipid metabolism. Folate is an essential requirement, specially during pregnancy. The phosphorus helps to maintain normal growth, kidney function and bone health. Magnesium boosts the latter, as well as regulates the heart rate. Finally, maize lowers LDL cholesterol and guards against cardiac diseases, diabetes and hypertension. The traditional maize, like other cereals, also provides proteins, lipids and little water. Maize has also diuretic properties when taken as a tea and is a component in certain oils, corn oil and syrup. One of the nutritional benefits of maize comes from its rich carbohydrate that is derived from its abundant starch. Maize is also very rich in thiamine or vitamin B1, which is necessary for the brain to absorb glucose and to transform that food into energy. Biotin or Vitamin B7 give nutritional benefits to maize, since the deficiency of this vitamin in the body affects the state of the skin and hair. The nutritional benefits of maize are also determined by its vitamin A, which functions as an antioxidant in preventing diseases such as cancer. The high fiber content is another characteristic linked to the nutritional benefits of maize. This condition makes it suitable for diets that are made to lose weight and those made with the aim of lowering cholesterol levels. Recent clinical studies in Japan, published in the journal Biochemical and Biophysical Research Communications, have shown that purple corn (Zea mays L.) could be a great ally in the fight against diabetes and obesity. Anthocyanin is the name of the pigment that gives color to purple corn. Last year a research team from Japan Doshisha University, Kyoto, was born to see that the purple corn extract increases the activity of a gene that regulates the function of fat cells. Obesity and diabetes are the great evils of this new century, and the properties of the purple corn then open new hope in preventing it. Purple corn extract or juice is a powerful antioxidant. This corn is also a good inhibitor of cholesterol and is a protector of the retina, stimulating blood circulation and also prevents the development of colorectal cancer. Promotes tissue regeneration, prevents cardiovascular diseases, retards degenerative processes in general, has anti-wrinkle action, increases blood circulation, encourages diuretic action, so that in future instead of the harmful soft drinks, take purple corn juice. Maize flour is used to make nutritious bread which is highly palatable, and is easily broken down in the body. When taken at intervals, bread helps to clean the colon and the dextrose produced is commonly used for medicinal purposes. Popcorn is a wholesome staple food made by heating small grains. It is easily digested by the body. In addition, it is practically starch-free and not fattening, and is converted into intermediate carbohydrates and dextrine, which is easily absorbed in the body. It promotes peristalsis and is also beneficial in preventing constipation. Maize facilitates the removal of toxic food substance and also accelerates the passage of faeces through the intestine. Additionally, it protects the digestive tract thus promoting function of the gall-bladder and reducing stomach acidity. Cereals generally wheat, rice, millet, oatmeal and maize should be eaten in large quantities since they are sources of carbohydrates and starch. According to recent studies, the use of maize helps to combat the effects of certain cancers, as it reduces the development of cancer. Maize is low in cholesterol and fat content. Cereal or whole grains are great sources of vitamins and minerals, magnesium, fiber and complex carbohydrates. The fiber in whole grains helps to prevent the risk of heart diseases and diabetes, and all its nutrients boost the immune system. The main shortcoming is that most people are not aware of the numerous health benefits of maize, hence fail to include it in their nutrition. The major points against consumption of maize include a possibility of fungal and microbial infection and toxicity and skewed Omega 6 : Omega 3 ratio. Besides these, some other concerns over consumption of maize happen to stem from the sugar and starch content of maize which gives this grain high calorific value. Not a very good news for weight watchers! This concern also gives rise to a very serious question - is corn oil good for you? Considering the ubiquity of corn oil in just about every processed and fried food and given its high trans fat content, corn oil is not at all a good option for daily cooking purposes. If you are a discretionary snacker and binge on those fries not more twice or thrice a month then it won't be very harmful for you! Regular consumption should be avoided. Is maize good for you? Not always! Although maize isn't fattening, it is a starchy vegetable, meaning it does contain carbohydrates. Consuming too many carbohydrates and overall calories can lead to weight and fat gain. If you're overweight, the American Dietetic Association encourages you to reduce your daily calorie intake by 500 to 1,000 calories per day for a weight loss of one to two pounds per week. The American Dietetic Association also reports that reducing carbohydrates rather than calories or fat may help with short-term weight loss, and reducing your carbohydrate intake results in a reduced overall energy intake, which is effective for weight and fat loss. Given both takes on the issue - is maize good for you? It can be determined that consumed in moderation and in its fresh form, maize is a great option for a healthy and tasty snack! As far as the concerns over corn allergy symptoms are concerned, let me tell you - it is extremely rare! Different people can be allergic to different things but that doesn't make that thing bad outright! Hey, we all know about people who are lactose intolerant but then the problem is not with milk, it is an issue with those people's systems which are unable to metabolize dairy! Given its high vitamin, phosphate and other nutrient contents despite the high fat and carb levels, if consumed once in a while and in moderation, maize does more good than harm!